One of the trends I’m absolutely loving this Spring is the use of muted pastel colours in home decor. I’m seeing a lot of blush pinks, seafoam greens and periwinkle blues in both furniture and accessories and it’s so pretty and fresh. I’ve even seen blush pink coloured walls and they’re just so gorgeous! 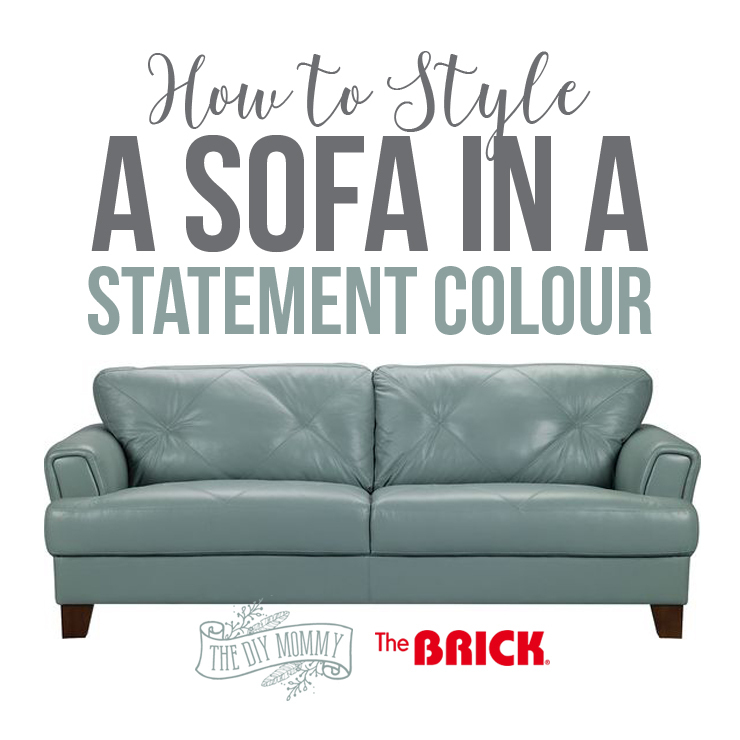 If you want to go for a fun change this Spring in your home’s decor, why not try a sofa in a statement colour like seafoam green? Today I want to show you how surprisingly versatile a pastel coloured couch can be and a few ways to style it. I got to play with this particular sofa in my home the other day – it’s the Vita 100% genuine leather sofa from the Cindy Crawford collection at The Brick. Isn’t the colour SO pretty? I’m always a huge sucker for anything in the turquoise, aqua, seafoam, or teal range. What makes this particular sofa so versatile in almost any room is the fact that its seafoam green colour is nice and muted. It has a good dose of grey in it so it’s a more sophisticated colour that blends well with lots of other colours in a room. By the way: the entire Cindy Crawford Home Collection is available for 70% off the ticket price when you buy the matching loveseat or chair! Click here to browse this deal. Now I’d love to hear from YOU! 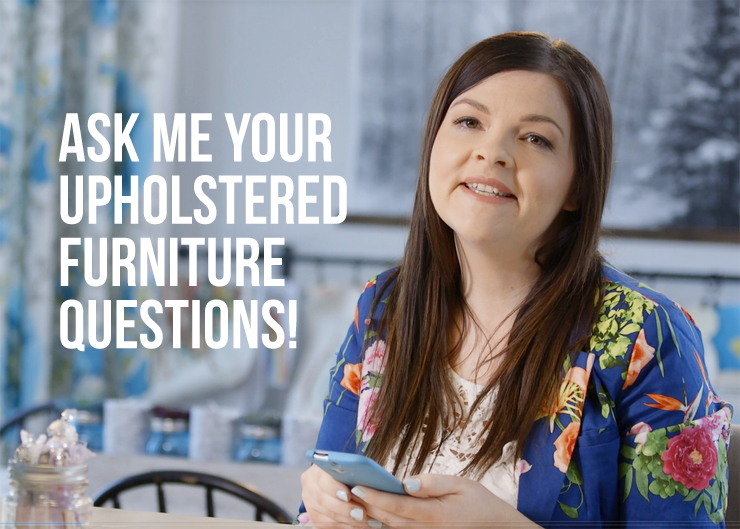 Have an upholstered furniture question you want answered? 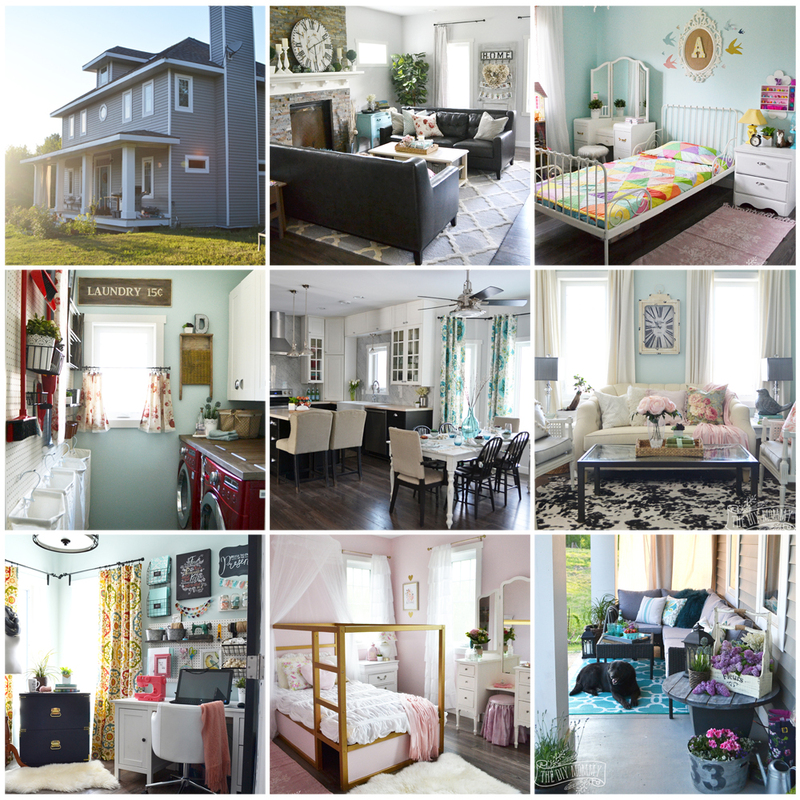 Wondering how to arrange your pieces, what material to choose with your paint colour, or how to find the best upholstered piece for your family’s needs? Comment below or on our social media channels (either mine or The Brick’s). 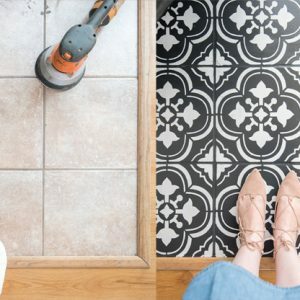 You never know: next month we might help you turn your living space into something fabulous! 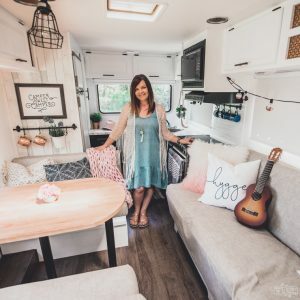 Chat with me on Facebook, Instagram, or Twitter about your Year of Upholstery (#yearofupholstery) question or chat with the Brick on Facebook, Twitter, or Instagram. I CAN’T WAIT to answer more design questions and work with The Brick to come up with some more exciting ideas for you! I love the color of the sofa and your tips are great! I need to get some fun and springful pillows for my home! I love this couch and the color! It would be perfect in my home. Love the couch and it looks beautiful with the contrasting pillows. Your tips are wonderful! I love this couch and even though it is not technically a neutral the color is so subtle it can work with many colors. Oh that sofa is beautiful!! I could just imagine the different ways to ‘decorate’ it though the seasons too, it just goes with everything doesn’t it? How fun!! Can you link the post for that oversized abstract painting please? I love it!!! 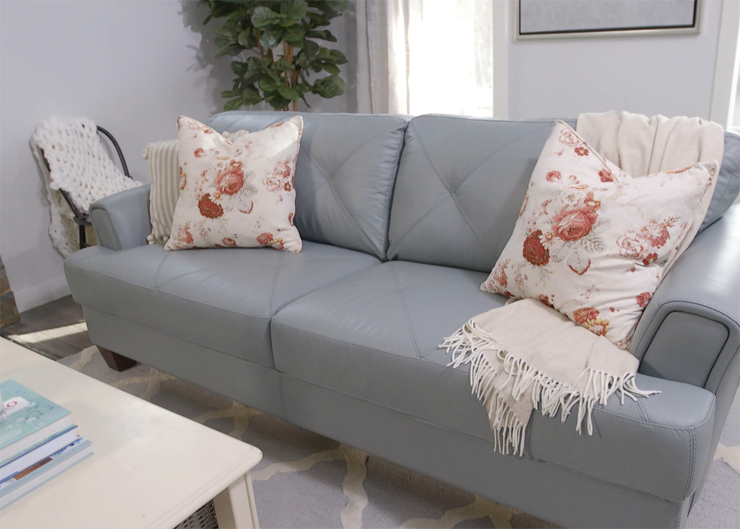 I bought the same sofa but we will only have it delivered in July when our home is built… on the video it looks more light blue than green. I thought it was more minty green… what do you think.. more blue or grwen?! Hi there we bought this Seafoam sofa and I wanted to have an accent chair but I am confused what colour and type of chair should I pick.